Update (01/16/15): Crenshaw Boulevard will be closed again tonight between Martin Luther King Jr. Boulevard and Stocker Street from 11 p.m. to 6 a.m. in order to finish paving the street for Monday’s parade. Update (01/15/15): In order to pave the street in preparation for the parade, Walsh-Shea Corridor Constructors (WSCC) will be fully closing Crenshaw Boulevard tonight from 11 p.m. to 6 a.m. between Martin Luther King Jr. Boulevard and Stocker Street. Traffic will be detoured eastbound and westbound on Martin Luther King Jr. Blvd. and Stocker St. For questions or concerns, please call the Crenshaw/LAX Project hotline at (213) 922-2736. The 30th Annual Kingdom Day Parade will be held this Monday, January 19 beginning at 10:45 a.m. The parade will start at Vermont Avenue and Martin Luther King Jr. Boulevard and travel west along Martin Luther King Jr. Blvd. It will then head south at Crenshaw Boulevard and end near Leimert Park, where the 11th Annual Kingdom Day Gospel Fest will be taking place from 11 a.m. to 5 p.m. Both events are open to the public. Metro’s float entry for this year’s parade is a 1950s replica of the bus Rosa Parks was seated in when she was arrested for refusing to give up her seat to a white bus rider. This year marks the 60th anniversary of the event. Metro will be running bus detours in the area beginning at 5 a.m and ending at 9 p.m, so the best bet to get to the parade will be the Metro Expo Line. All Metro bus and rail lines will be running on a regular weekday schedule. To watch near the start of the parade, exit the Expo Line at Expo Park/USC Station and walk south through Exposition Park to Martin Luther King Jr. Blvd. To view the parade near the end of the route or to attend the Kingdom Day Gospel Fest, exit at the Expo/Crenshaw Station and walk south on Crenshaw Blvd for .8 miles. 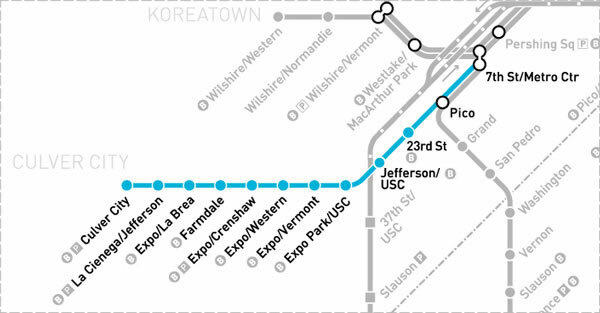 For those willing to transfer, a slightly shorter walk is available by transferring to the Metro Line 210 — which will be on detour — and then exiting at the 39th St./Crenshaw Blvd. stop. The parade will be one block south. From there, the Gospel Fest will be an additional 10-minute walk south along the Crenshaw Blvd. portion of the parade route. Bus lines that will be detoured because of the parade and Gospel Fest include: 40, 102, 105, 204, 206, 207, 209, 210, 212, 710, 740, 754 and 757. For more details on route detours, visit Metro’s Service Advisory page. L.A. Metro will be joining the communities of south L.A. to celebrate Martin Luther King Jr. Day in the 30th annual Kingdom Day Parade on Monday, January 19. To avoid traffic and detours because of the parade, parade-goers are encouraged to take the Metro Expo Line which runs a few blocks north of the parade route. Metro officials participating in the parade include Metro Board Member Jacqueline DuPont-Walker and Metro CEO Art Leahy. Metro’s entry to the parade is a vintage replica of the bus Rosa Parks was riding in when she was arrested for refusing to give her seat to a white bus rider in Montgomery, Alabama in 1955. The replica bus is meant to highlight transit’s role in the civil rights movement and to celebrate the 60th anniversary of Park’s historic stand that became the catalyst of the movement. The parade begins at 10:45 am at Vermont Avenue and Martin Luther King Jr. Boulevard. The parade route is approximately 3 miles long and will travel westbound along Martin Luther King Jr. Blvd. to Crenshaw Boulevard, where it will then turn south and end near Leimert Park. For viewing near the start of the parade route, attendees should exit the Metro Expo Line at the Expo Park/USC station and walk south through Exposition Park to Martin Luther King Jr. Blvd. For viewing near the end of the route, attendees should exit the Expo Line at the Expo/Crenshaw Station and either walk south to Martin Luther King Jr. Blvd. or transfer to the Metro Local 210, which will be on detour, exiting at 39th Street and Crenshaw Blvd and then walk a block south. All Metro Bus and Rail lines will be running on a regular weekday schedule. While visiting the area, parade-goers are encouraged to experience what local businesses along the parade route have to offer. Through Metro’s Eat, Shop Play Crenshaw campaign, members of the public can pledge to eat, shop, play in the Crenshaw community. Not only does pledging support the economy of the local community, but pledgees that spend $25 or more at participating businesses will be entered in a quarterly drawing to win cash prizes. Metro staff will be available to assist those interested in making the pledge and answer questions about the program at the Eat, Shop, Play Crenshaw booth located at the 11th Annual Kingdom Day Gospel Fest, a concurrent event open to the public being held near the end of the parade route on Crenshaw Blvd. between Vernon Street and 48th Street from 11 a.m. to 5 p.m. Representatives from Metro’s Diversity and Economic Opportunity Department (DEOD) and Human Resources will be available at the same location to provide information on Metro business and career opportunities. Staff from Metro’s pilot Business Solution Center (BSC) will also be on hand to detail the services now available to local small businesses that may be impacted by the construction of the Crenshaw/LAX Project. Because segments of the parade route are adjacent to the construction of the future Crenshaw/LAX line, Metro and its contractor Walsh-Shea Corridor Constructors have made alterations to accommodate the parade. They include modifying the decking construction schedule at Martin Luther King Jr. Blvd. and widening the work zone along Crenshaw Blvd. to make room for floats. More information on the Crenshaw/LAX Project and Eat, Shop, Play Crenshaw is available online at metro.net/crenshaw. The Kingdom Day Parade will be broadcast live on KABC-TV (Channel 7) beginning at 11 a.m. In 2014, the parade garnered approximately 2.5 million television viewers and radio listeners. Metro Bus lines that will be detoured during the Kingdom Day Parade include: 40, 102, 105, 204, 206, 207, 209, 210, 212, 710, 740, 754 and 757. Signs in English and Spanish will be posted at bus stops regarding the temporary routes or check Metro’s Service Advisories for the latest changes. Since Art will be appearing in the parade wouldn’t be great to see him driving that old MTA rapid transit green bus. He might have even driven that same bus as a bus operator. The 5100 series buses were originally ordered by both the Metropolitan Coach Lines and the Los Angeles Transit Lines. Because of that some arrived painted two tone green, MCL’s paint scheme while others arrived painted yellow, LATL paint scheme. The MTA adopted the MCL paint scheme and much of their equipment was painted that color including one former P. E. Interurban which is now on display in Travel Town, Griffith Park. These buses were still in the fleet when I arrived at the RTD in 1980.